Dr. Weiner introduces a unique nonsurgical procedure using Botox to slim and narrow one's mid and lower face. 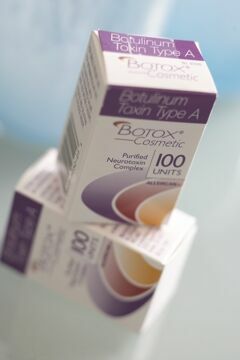 BOTOX® Cosmetic is a purified, protein, used to block nerve impulses and temporarily relax muscles that cause wrinkles. BOTOX® has been available for since 1989 and approved for cosmetic use in 2002. It is approved in over 75 countries for numerous uses. It is the most popular cosmetic procedure in the U.S. and the world. What is BOTOX® Cosmetic used for? BOTOX® Cosmetic is primarily used for treatment of wrinkles. Only dynamic wrinkles may be treated with BOTOX® Cosmetic. These are wrinkles that become apparent with active facial movement. Describe what a BOTOX® Cosmetic treatment is like. A BOTOX® Cosmetic treatment consists of a series of injections into the area in which you, the client, wants to relax. Typically the entire procedure will last between 5-10 minutes. The discomfort is minimal, particularly at the Aesthetic Clinique. There will be small bumps at the injection sites which last for at most 15 minutes. After a procedure, what should I do? A client should actively move the muscles injected so as to promote absorption of the BOTOX® Cosmetic. The areas injected should not be rubbed, and a hat should not be worn for at least 3 hours. Also strenuous physical activity must be restricted for those first 3 hours as well. When will I see the results and how long will they last? There will be no results seen until 36-48 hours. At that time, you will start to see the effects. In some clients, this can take up to 5 days. Complete results will be apparent in 7-10 days. Results will last for 3-6 months, with most clients getting about 4 months of effect. As the BOTOX® Cosmetic wears off, you will gradually see return of the muscle function, and return of the wrinkles. For best results, it is encouraged to get repeat BOTOX® Cosmetic treatments before the prior treatment’s effects are complete worn off. I have also heard that BOTOX® can be used to control sweating, please explain. BOTOX® is FDA approved for hyperhidrosis, excessive sweating. Typically, clients have tried multiple topical therapies with success. The most common areas treated are underarms and hands. Treatment for the underarms is easily tolerated but hand treatments require a simple nerve block to control discomfort. After one treatment results last about 6 months. With a second treatment, prolonged results for a year or longer can be obtained. Typically, 100 units are required for best results. Dr. Weiner has a technique in which no nerve blocks are given and the procedure is nearly painless. How about use for migraines or TMJ headaches? Clients who have headaches, particularly in the forehead, can have marked improvement with BOTOX® injections. Frequently these headaches are the result of excessive tension in the muscles of the forehead and BOTOX® relaxes these muscles. In fact, people with tension from TMJ can benefit from BOTOX® injections as well. Can Botox be used for slimming the face? People that have enlarged masseter muscles, usually from bruxism (grinding their teeth), can benefit from injections of Botox. The Botox causes atrophy of this muscle and turns a square shaped face into more of a heart shaped face. This is a gradual process and takes a few treatments. The affects can be long lasting as long as the Botox is kept up. Many asian women have this problem and have benefited from Botox. Be careful who you go to see for this injection because there are many reports on Realself.com of patients having a crooked smile after getting this injection from an inexperienced physician. Dr. Weiner has been injecting the masseter muscle since 1994. Dr. Steve Weiner is a board certified Facial Plastic/Head and Neck Surgeon. His services include BOTOX cosmetic, Restylane, Belotero, Juvederm, Perlane, Juvederm Ultraplus, Radiesse, injections. He also performs laser resurfacing with the new Fraxel Dual Laser, Spectra Laser Peel, Coolsculpting, Infini, Dermapen, PRP, Laser Hair Removal. Ulthera. He services: Destin, Panama City, Rosemary Beach, Seaside, Watercolor, Watersound, Crestview, Niceville, Atlanta, Birmingham, Nashville, and Sandestin.